The Number 22: Is There A 'False Narrative' For Vet Suicide? Do 22 veterans really take their lives daily? Despite this number becoming a rallying cry for activists trying to prevent suicide among vets, new research suggests the statistic is a bit of a guess. 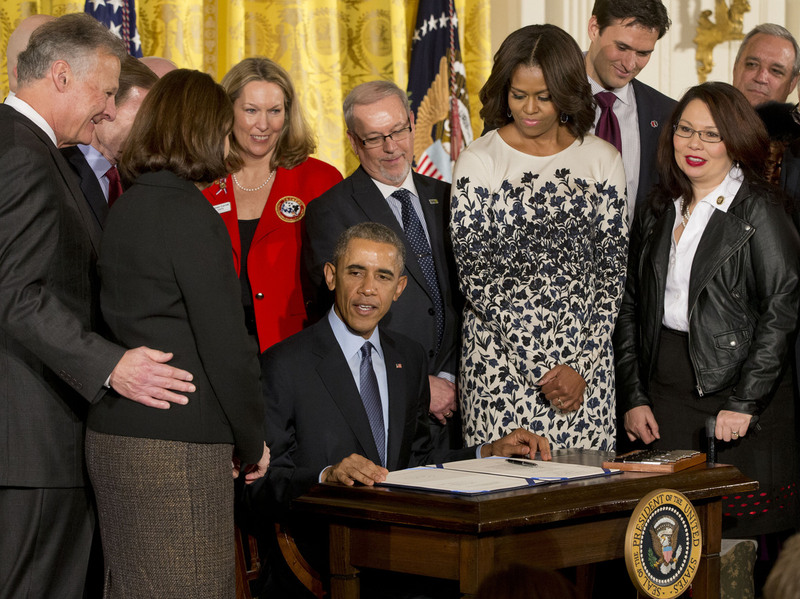 President Barack Obama signs the Clay Hunt Suicide Prevention for American Veterans Act, named for a Marine Corps combat veteran who struggled with post-traumatic stress disorder after serving in Iraq and Afghanistan and who killed himself in March 2011 at the age of 28. The bill calls for evaluation and expansion of existing Veterans Affairs mental health and suicide prevention programs. A single number has shaped the way that Americans think about young military veterans. It's the number 22, as in, 22 vets take their lives each day. The number has become a rallying cry for advocates trying to call attention to suicide among vets, especially those who served in Iraq and Afghanistan. Twenty-two, not some vague, rounded-off number. Not 30, not 20. Twenty-two. A number so specific it inspires action. Speeches, fundraisers, marches and even walks clear across the country. But 22 doesn't quite add up. There were lots of news stories this summer about Toby Flaget, a retired police officer and Marine veteran, who walked from Oregon to New Jersey wearing a T-shirt that said "22 is 22 too many." "People don't want to talk about it. But it's a real problem," Flaget says. There's actually a different problem. That number, 22, doesn't really apply to the veterans everyone thinks it does: those who served in Iraq and Afghanistan. "That number, if we talk about it out of context, it's questionable," Keith Jennings, Iraq combat veteran and clinical psychologist, says. He acts as chief science adviser for a North Carolina-based group called StopSoldierSuicide.org. "So when we talk 22 deaths a day, we as Americans think that number? 22? I can hang my hat on it. 'Cause it's a hard number. But it's not, there's a big plus or minus, uncertainty and variability behind that," he says. Jennings says the 22 research was a Herculean effort by good VA scientists, but it's not what advocates and politicians often suggest. The study looked at vets of all ages, and found that most who killed themselves were likely too old to have served in Iraq or Afghanistan. The authors were clear about that, and other caveats, but their cautions are often ignored when people talk about the number 22. Plus, suicide is notoriously tricky to study. One reason is that it's relatively rare. "It takes so long to put together good data on suicide research because we need enough time to lapse to allow enough cases to accrue for us to start making meaningful sense of the data," says Derek Smolenski, a Defense Department epidemiologist and statistician. He says suicide studies are usually full of caveats like that. So Smolenski and a team, in a study released this year, dug deeper. They found that vets who had served during the Afghanistan and Iraq wars commit suicide at a rate of about one a day — not 22. Of course, even one a day is a lot. And younger military vets are committing suicide much more often than civilians. Doctors treating veterans want researchers to identify which groups of vets are most at risk, like troops who saw heavy combat or soldiers who were pushed out of the service early. "That helps us focus what should our efforts be as far as outreach, education, prevention and treatment," says Dr. Bruce Capehart, who heads the mental health program for Afghanistan and Iraq veterans at the VA Medical Center in Durham, N.C.
"But we have to know who the people are that need those treatments before we can offer it to them and help them become engaged in care," Capehart says. Helping vets: that's what the number 22 motivated a lot of people to try to do. Jennings, the clinical psychologist, agrees it has raised awareness. But he worries that the big, inaccurate, number contributes to a corrosive stereotype about Iraq and Afghanistan veterans. "That narrative goes something like, American enlists, American goes to war, American comes back and is diagnosed with a mental health condition or is broken — somehow there's this connotation — and because they have PTSD, they ultimately kill themselves. That's a false narrative," he says. Jennings is the son of a Vietnam vet and grew up surrounded by successful, well-adjusted veterans of that war. But he admits that when he thinks about Vietnam vets, his mind conjures up the Hollywood stereotype of a vet, begging from a wheelchair with a POW-MIA flag. This kind of narrative is powerful stuff, but Jennings says it shouldn't define young veterans. "What gets lost in the conversation is the majority — actually you can say the vast majority — do OK," Jennings says. "The vast majority of our veterans do OK."
Something, he says, that people should remember when they meet a young combat vet — or when they hear the number 22.